coldantlerfarm: Eight Years of Gibson! Gibson recently had a birthday, eight years old! 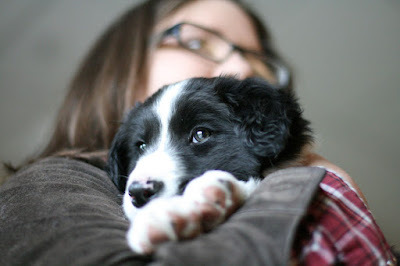 He was the dog I dreamed of in the first paragraph of my very first book. The dog I secured online for a farm before I even bought a place to call our own. And the dog I picked up from the Albany airport in early summer of 2010 and brought home to his own 6-acre sheep-filled abode! Gibson means the world to me, and has been there for every triumph and tear on this land. I love you, Gibson. I love you every minute of your life.